Information and discussion about pain. Headache, Eye pain, Ear pain, Face pain, Jaw pain, Mouth pain, Front neck pain, Neck pain, Shoulder pain, Elbow pain, Wrist and hand pain, Chest pain, Stomach pain, Genital pain, Back pain, Hip pain, Knee pain, Foot pain, Generalized pain, Infections and pain and Cancer Pain. Physical activity is a good way to feel better, get fit and beat pain. You can start your own home with simple free exercise videos for everybody, Tv-Gym.com. Headaches are very common and there are several headache types. Headache may also be called cephalgia. An estimated 80 percent of people suffer from headaches periodically. It is by no means always a sign of an underlying illness—you can get a headache because of a flu, too much partying, overexertion or nagging problems. There are many headache causes, but it is rare that a headache should signal a life threatening illness, but seeing a doctor is advised if the headache disturbs daily life, or it changes its form. A new and sudden headache symptom should always be looked into promptly. Headache treatment can be effective and there are a lot of efficient remedies for headache, so one has no reason to grin and bear the pain. The most common cause for headache is muscular tension. Approximately, a third of Finnish adults suffers from it. It was thought to be caused by excessive tension in the head and neck area muscles, which cuts down on circulation and causes pain. The exact origination mechanism is not known. According to some theories, tension headache could be due to central nervous system reasons. One explanation is a functional disorder between different areas of the brain. Patients with tension headache react sensitively to pain. Anxiety and depression are also common with these patients. There are suggestions that those experiencing tension headaches are characteristically more conscientious and perfectionist. Heredity most probably plays a role in tension headaches. According to one research project, close relatives of those suffering from tension headaches are three times as likely to have the same symptom. The pain associated with tension headaches is commonly described as a tight band around the head or a tightening, pulling or shooting pain or as muscle stiffness. The scalp may feel sensitive. 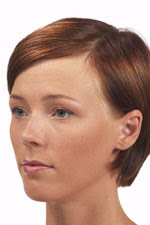 The sensations are usually felt on both sides of the head but may be on one side only. 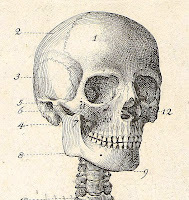 The pain is mostly felt in the back of the head, forehead, temples and top of the head. Usually the pain begins gradually and gets worse towards the afternoon. Unlike in migraines, there generally are no visual symptoms like blind spots or flashing lights, vomiting, pain in the stomach, additional feelings on one side of the body, or disturbances of speech. In migraine physical activity usually increases headache, not so in tension headache. Tension headaches can be periodic or chronic. In the case of periodic headaches, the headache lasts for a few days. If the headache is present more than two weeks per month, it is classified as a chronic tension headache. The periodic headache can become chronic, constant headaches are, however, rare. There are normally no warning symptoms. The headache is not particularly strong, but can be felt for days and weeks, sometimes longer. The headache is usually continuous and not episodic. Stress and a busy lifestyle, jaw clenching or depression and anxiety may trigger tension headaches. The symptoms can get worse with a poor posture when working at a computer, driving a car or while performing comparable functions. Sometimes the headache is accompanied by an unpleasant feeling of dizziness and unsteadiness. Nausea may be present as well. Exercising and spending time outdoors generally are helpful. The symptoms normally ease up during the time off from work. The examination often shows sore muscles sometimes both in the neck and head region. There are no visible signs of disturbance in the nerve functions. If additional examinations like MRI are performed, they usually show no abnormalities. X-rays or MRI may show straightening of the cervical spine as a sign of increased muscle tension. The treatment usually consists of anti-inflammatory medication, muscle relaxants, antidepressants, physiotherapy, and acupuncture. In the most problematic case hypnosis or biofeedback may be useful in increasing the ability to relax. It sometimes takes time to find the best headache cure, but relief usually can be obtained. In physical therapy, the initial emphasis is on relaxing the muscles. If harder training is pursued when the muscles are very tense, it may cause a worsening of the symptoms. In milder cases the treatment initially can also include exercise. As first aid, anti-inflammatory medicines may be used to treat tension headache according to the package instructions. Your doctor may prescribe medication to relieve symptoms as they appear or as a preventive method to decrease intensity and frequency of the headaches. Correct posture while working and performing housework is important as well as taking short breaks during which one can do light neck and shoulder exercises. While working at the computer it is important to make sure that there is enough room in front of the keyboard and that the monitor is not placed too high. Avoid using a diagonal work posture. The monitor should be free of reflections. If necessary, one should get glasses that lend themselves to work with computer terminals. Working in continuous stretches and driving long distances should be avoided. While driving, hold on to the lower half of the steering wheel and try to relax the shoulders whenever possible. While working, check periodically whether your muscles are too tense, and then try to relax them. If you have a tendency to push your head forward while working at the computer, observe and correct your posture several times a day. Keep your neck straight while sleeping. A suitable form of exercise would be one where the muscles contract and relax as a counterbalance to permanent tension. Make sure you are in good general condition. Hobbies that cause muscle tension, such as crocheting, knitting and reading while lying down should be avoided. Choose sports where you can exercise the muscles in multiple ways. While swimming, for instance, it would be good to learn different styles such as crawl and backstroke and switch between them. Practice breaststroke so that your head is periodically straight under water. Use a cap and goggles if you don’t want to get water on your hair or in your eyes. It is important to relax adequately. An orderly lifestyle lessens the symptoms. Avoid staying up too late. It is easy to differentiate between a migraine and a tension headache in the most typical cases. Unfortunately sometimes the symptoms do not adhere to the textbook versions, and one can experience both symptoms at the same time, and they may feed off each other. Preliminary symptoms such as vision, hearing, speech or movement disturbances can exist before an actual migraine attack. This so-called aura stage may last for several minutes. Vision disturbances occur in both eyes and may involve, for instance, blurred vision, zigzag figures, a blind spot, tunnel vision, stars or spinning bright light or pain in the eyes. Aura usually develops about 10 minutes before the actual migraine pains. Not everyone, however, has an aura. When the actual migraine attack begins, the aura usually fades away. Migraine headaches can be severe. They often start on the same side every time and pain is worse on one side. In the classic migraine, the headache is pulsing or pounding and can be accompanied by nausea and vomiting, increased urination, diarrhea, shivering, sweating, chills, trouble finding words, fatigue or loss of appetite, heart symptoms and changes in blood pressure that can be periodic in nature. Even though functioning may not be possible during the active migraine headache, the time between the episodes is usually asymptomatic. Sleeping, cold or dark environments relieve, and physical exertion will make the pain worse. During the attack light and strong noises disturb the patient, and all senses are keener. Some patients may have a hangover type of state after migraine attacks when they need to sleep additionally and feel they're thinking is not very clear. Women are more prone to migraine and heredity plays a big part in its onset. In most cases the symptoms appear before the age of 35, but can begin even during menopause. A daughter whose mother suffers from migraines has a 50 percent likelihood of getting migraines. Migraines can also skip a few generations. Migraine attacks may be triggered by hormone changes during a menstrual cycle or by birth control pills. Foods like chocolate, red wine, and cheese can trigger a migraine. Some additives such as nitrates, monosodium glutamate, tyramine and aspartame can act as triggers. Marinated foods, foods preserved with vinegar, and fermented foods may trigger a migraine. Nuts, pizza, and very cold beverages or foods have been associated with the onset of a migraine. This does not mean that all these foods cause headaches in any one person. It can be just one food or substance and in that situation others can be used without restrictions. If a food causes migraine, it will do it every time the food is eaten. The reason for migraines and other vascular headaches is apparently vascular constriction in the beginning stage and expansion at a later stage. Active substances that cause inflammation-like changes are released in connection with this, and that causes pain. The cause for this is unclear. It seems that the vascular system of those people who get migraines is more sensitive to stimuli. Migraine in women is a risk factor for disturbances in cerebral blood circulation. This risk is multiplied with the use of birth control pills and tobacco products. When suspecting a migraine, the most important research method is mapping of the symptoms and a thorough examination performed by a doctor. Modern methods such as computer tomography and an MRI can easily rule out tumors or other serious illnesses as causes of the headache. Headache journal is a good way to follow your headache symptoms, memorize the duration, location and severity of the pain, medications and their effects and possible outside factors triggering headache. It will be easier for your doctor to find a better cure for the headache. Rest and medication are the most important parts of treating a migraine. Cold compresses can be used as well. An hour’s rest is recommended even though the symptoms might disappear with medication. It is important to find the right medication. There are many efficient products on the market, and a doctor can help you find the most suitable one for you. If migraines are frequent, a continuous preventive treatment may be necessary. Neurologists are the best experts on migraine and its medication. Migraine medications to be taken during migraine attacks to stop symptoms that have already begun are most often nonsteroidal anti-inflammatory drugs or NSAIDs, triptans or substances that contain ergotamine. The pain medication can be taken together with an anti-nausea medication or in combinations. If it is necessary the medication can be given in the form of suppositories. It is best to take pain-relieving drugs when first signs of a migraine attack are felt. For optimal effect, it is good to rest or sleep in a dark room if this is possible. Preventive medications can also be used. They are usually taken regularly to prevent attacks or to make them less severe. Acupuncture treatment may sometimes prove amazingly efficient in treating migraines. Biofeedback may be effective in migraine. Relaxation techniques, massage, herbs and vitamins are also used. If a substance, stimulus, hurry, neck-straining work or stress triggers a migraine, prevention is the best way. This can be difficult, in reality, with other factors than food and sauna going habits. It is hard to avoid stressful situations and work pressure entirely. The least one can do is to use correct ergonomic work posture. Anyway, triggers should be avoided as much as possible. Self-care should include steady sleeping patterns with enough but not too much sleep. Muscle relaxing exercises can be tried. Some people may get rid of migraines by eliminating episode-causing foods and beverages from their diet. Experimentation is the key here. The triggers can be listed by keeping a headache journal, where notes on attacks and the circumstances leading to them, such as foods or beverages, are noted. Some experience suggests that prevention of low blood sugar levels may prevent migraines. The method entails eating small meals several times a day in order to keep the blood sugar level stable. Migraine patients might try stopping smoking and excessive drinking of coffee, as these may make the symptoms worse. Tension headaches and migraines can often be found in the same person. In this case, one illness may worsen the symptoms of the other. During a migraine, muscles become tenser, which can trigger another tension headache. In this situation, it is advisable to treat both problems simultaneously. When treating migraines and other pain, one must also note that in some people the overuse of medication can cause headaches. This applies to the previously often used ergotamine as well as to all other pain medications, including the new migraine medications. When a person gets used to a medication, it will help the headaches, but over time the low blood level of the medication may cause by itself a rebound-type headache. Headache may be caused by use of some chemical, for instance an additive, or its termination, also overuse of medication may induce headaches. The more common withdrawal headaches occur with caffeine, estrogen and opioids. Furthermore, nitrates, analgesics, oral contraception medication, corticosteroids, tricyclic antidepressants and many other drugs may cause this problem. Diagnosis of withdrawal headache is usually clear only when other reasons have been excluded and if the headache disappears or improves after withdrawing the substance. Ergotamine will cause dependence if taken every other day. The understanding of the risk level of pain medication is not as clear. It is estimated that only 20 doses of medicine per month may cause withdrawal symptoms and those who take at least 100 doses clearly increase their risk of incurring problems of this type. The symptom is usually a continuing low-grade headache that is worst in the morning and is relieved shortly after taking pain medication. Other symptoms such as nausea, anxiety, feeling less alert and energetic and experiencing difficulty concentrating and memory problems may appear. The headache is felt as a dull ache on both sides of the head on the forehead, temples, and the neck. It is advisable to change the medication with the help of your doctor. Sometimes it may be the easiest to do this in a hospital environment. Most people will be able to lower their use of medication, which will also reduce the frequency of headaches. Those who drink a lot of coffee may experience a morning headache when the level of caffeine in the blood is low. They may experience headaches during the day for the same reason. Even three cups of coffee a day will cause a caffeine dependency. It has been demonstrated that stopping daily caffeine intake changes blood flow in the brain. This is likely to give the caffeine withdrawal headache. It has also been registered changes in EEG rhythms in the withdrawal period that are considered to be linked to the fatigue. In a situation like this it would be advisable to stop drinking coffee. Withdrawal symptoms may appear, but as they pass, the headaches will be reduced as well. If you love coffee, you may start drinking it again after a few weeks, but only a maximum of one cup per day. It is good to remember that other products than coffees also contain caffeine. It used to be thought that blood vessel dilation is the main cause of the pain in a group called vascular headaches. Cluster headaches serial headaches, migraine and toxic headaches were described as being part of this group. Less common than migraine are the so-called cluster headaches and serial headaches. The basic causes for these headaches are not known. Probable impetus for the symptoms may be a regulation disturbance in the hypothalamus. The pain is usually one-sided and very strong. It is accompanied by tearing in the eye region. Nostrils may become stuffy and there may be many episodes in one day. The painful period lasts from weeks to months and is followed by an asymptomatic period during several months or even years. Sometimes the illness may become chronic. Diagnosis is based mainly on the symptoms. Sometimes at the time of the attack one may see constriction of the pupil, drooping of the eyelid and redness in the conjunctiva. The episode may begin after sleeping, taking a sauna, or drinking alcohol. Rest does not alleviate the pain as is generally the case with migraines; on the contrary, rest may actually worsen the situation. Initial treatment may be in the form of anti-inflammatory pain medication. If this does not work, the newest migraine medication may give relief. Breathing pure oxygen is often helpful but difficult to arrange in real life. Cortisone has been used in breaking up the period of pain. Some people get strong short-term headaches in connection with physical exertion. The reason for this is believed to be vascular. There are three types of these headaches. It may occur in about 1% of people in connection with physical exertion, cough or sexual activity. The pain starts immediately or very quickly after beginning of the triggering physical activity. The pain is usually very intense and is often described as bursting or explosive. Most people have bilateral pains; the headache may be in any location. Most exertion headaches are benign but anyone developing a severe headache of this type should be checked by a specialist because sometimes intracranial reasons or other neurological problems may be behind this phenomena. Maxillary sinus infections are a very common reason for headaches that cause sufferers to get treatment. Almost a third of the patients at health care centers falls in this category. 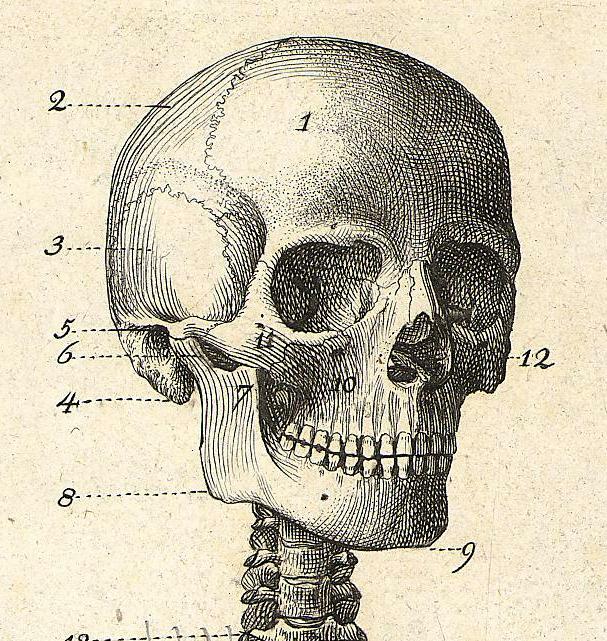 The maxillary sinuses are cavities inside the skull. When they get infected, their mucous membranes swell and infectious secretions may collect in them. The maxillary sinus openings may get blocked, which causes pressure as the secretions increase. It is most common to have symptoms in the maxillary sinuses, but the frontal, ethmoid, and sphenoid sinuses may also get infected. The risk for maxillary sinus infections is higher if a person tends to be allergic, if he has hay fever or asthma, or if he smokes. Maxillary sinus infections often accompany various respiratory infections. Anatomical risk factors include a deviated nasal wall or polyps. A foreign intranasal object, swimming or diving, climbing in high altitudes, flying or pressure injuries may also have an effect. Headache typically starts when a person has a cold or just after it. The symptoms of a maxillary sinus infection may include, in addition to headaches, a feeling of heaviness in the cheeks or pain in the cheeks or behind the eyes. Pain during vibration or sudden movements may be felt in the teeth or cheek. Because mucus has been collecting during the night, pain may be worse in the morning. Sudden changes in temperature may worsen the pain. The nose can be stuffy with purulent, yellow or green discharge that can drip down the throat. There may be swollen passages of the nose and also symptoms of infection like mild fever or general feeling of fatigue and not feeling well. During a doctor’s examination, the patient may have painful sensations when tipping the head forward or when the cheekbones are tapped on. Face may be tender to the touch. The diagnosis can be obtained with the help of an x-ray or an ultrasound. The best way of diagnosing this problem is a maxillary sinus puncture. Then the symptoms are being treated simultaneously as the bacteria are sampled for their resistance to antibiotics. The treatment of a maxillary sinus infection usually consists of antibiotics when nasal drops used to shrink the mucous membranes or allergy medication won’t cure the symptoms. If antibiotics don’t work, a maxillary sinus puncture may be a necessary treatment option. As a self-remedy, nasal drops that shrink the mucous membranes can be used. The best way to administer the drops is by lying down. When the drops have been placed in the left nostril, it is advisable to wait for a moment and turn on the one’s left side in order for the medication to penetrate the maxillary sinus. 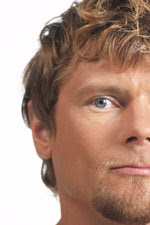 After placing the drops in the right nostril, one can then respectively turn on the same side. Nasal drops should not be used long term, because they can cause symptoms of a head cold by themselves. It is advisable to keep the air humid in one’s home. Steam inhalation several times during the day either in a hot shower or from a container of steaming water is recommended. Warm compresses over the maxillary sinuses may help with the pain. One may rinse the nose with water in the shower. Some spices are thought to be beneficial for the mucous membranes—try foods spiced with garlic or cayenne pepper. Psychiatric illness can be associated and have influence on headache but psychiatric disorders as the main cause of headache are rare. The majority of headaches connected with mental problems just exist simultaneously and independently at the same time. If the headache is caused by psychiatric illness it should occur only during the psychological disorder. Psychological factors can influence headache pain via various central mechanisms, and pathways. Neurotransmitters may have a role in this linkage. The association seems to go both ways. People with chronic headache have an additional risk to develop depression, and individuals, which have depression seem to suffer headaches more often. It has been shown that soldiers with migraines were twice as likely to have depression, anxiety or post-traumatic stress disorder, than soldiers with no migraines. A headache connected with depression is often dull and generalized, usually not very severe. It may be worse in the morning and evening. One attack can last anywhere from 15 minutes to days. Headache may last for years or for the entire life. Depressive headaches typically come regularly at the same time of the day or the week, for instance, always on the weekends or on the first day of vacation. Over 84 percent of people with depression also experience headaches. When the depression is at its worst, the headache is too, and when the depression eases, so does the headache. Sometimes it is difficult for the patient and the doctor to diagnose depression in its beginning stages. When a person feels tension and fear without known cause he is said to have anxiety. Anxiety reduces the tolerance of stress and may increase stress associated chemicals and trigger headache. It has been estimated that people with anxiety have a high risk to get chronic headache problems. Women are at more risk to have both anxiety and headache. In addition, other mental health problems may be connected to headaches. If an individual has both headache and depression or some other psychological problem, it makes sense to treat both in an appropriate way rather than use only medication for the headache. Inflammations in the teeth and other structures in the mouth, occlusion disorders as well as eye problems, functional disturbances with the jaw joint and trigeminal neuralgia may also cause headaches. Please see Jaw pain and Face pain for more info. Headache is a common complaint during pregnancy. They may appear at any time during pregnancy. In the beginning, they may be caused by increasing hormone levels. Of course also lack of sleep, stress and poor postures increasing muscle tension can be blamed in any phase. Sometimes regular migraine headaches maybe come less severe during pregnancy. This is, however, not always the case. In some cases, the symptoms may get worse. It is important to check the migraine medication when pregnancy is possible to be sure not to harm the child. In the later stages of pregnancy headache can be a symptom of high blood pressure. Women often experience headaches during their menstrual period. This problem may disappear during pregnancy. Some birth control pill types make migraine symptoms worse, although a minority of the users has fewer symptoms while using the birth control pills. There is often a fear that headaches are associated with brain tumors. People whose single symptom is a headache are seldom diagnosed with brain tumors. Only about 8% of people with brain tumors have a headache as a first symptom. However, up to half of brain tumor patients experience headache. The typical first symptom in connection with a brain tumor is an epileptic seizure that is not connected to a brain injury or use of alcohol. Most brain tumor patients have also some other symptoms like personality change, double vision or weaknesses, not only headache. Headaches connected with brain tumors usually have been traditionally thought to appear in the morning before rising and clear up within a few hours, to be of dull and aching quality and to be associated with nausea and vomiting. They have been considered to appear especially when lying down or while sleeping and become with time more frequent and severe or maybe even constant and to be not easily treated. 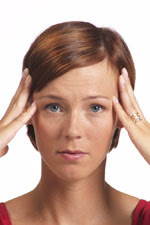 Fresh headache or changes in headache patterns, severity or location raises concern. Furthermore, new exertional headache, a headache that develops after physical activity like heavy lifting, running or coughing, should be looked at. Dangerous headaches include those in connection with a cerebral hemorrhage, meningitis, and encephalitis. The headache is often so strong in these cases that grown up patients usually see a doctor without hesitation. Signs of an infection are usually present with meningitis and encephalitis. The onset of bacteria-induced meningitis can be very rapid and violent. Usually children get it via droplet infection. The symptoms associated with this illness include fever, shivering, headache, nausea, and vomiting as well as sensitivity to light and a stiff neck. A child with meningitis cannot bend her head to her knees even with help. Neonatals and young infants may not experience the stiff neck symptom. Irritation and even loss of consciousness may be present also. If meningitis is suspected, the patient must go to the emergency room immediately. Meningitis or in the other words bacterial infection of the membranes covering the brain and spinal cord and septicemia or infection of the blood, commonly known as blood poisoning is very difficult to diagnose in the early stages. Especially this is the case with children because the first symptoms are usually fever, vomiting, headache and feeling unwell, just like many other mild illnesses. Meningitis Research Foundation has introduced six symptoms that can help differentiate meningitis and septicemia from other flu-like illnesses. These symptoms are: limb pain, a rash, stiff neck, dislike of bright lights, confusion, and cold hands and feet. A cerebral hemorrhage is bleeding in the brain caused by the breaking of a blood vessel. It may develop anywhere in the brain. The causes may be, for instance, high blood pressure, malformation of the vessels or brain injury. Sometimes no cause is evident. Large hemorrhages are fatal within a few days in about half of the patients. Symptoms usually develop suddenly, without warning signs, getting worse over time, often during some activity. They may include neurological symptoms such as loss consciousness, speaking difficulties, balance and movement changes, seizures, etc. Headache may also be present. It may awaken individual from sleep, increase with change of position, bending, straining or coughing. It may also be mild or absent in the elderly persons. Headaches should be examined thoroughly at least once. After this the fact that one does not know the reason should not cause further headaches. Headache associated with convulsions, confusion or loss of consciousness. Headache associated with symptoms of paralysis. A strong headache associated with a high fever and possibly nausea, sensitivity to light and vomiting. Headache associated with pain in the ears or eyes. A sudden violent headache that does not get better. A change in the character of a previously diagnosed headache. Early morning headache possibly associated with nausea or vomiting. Headache that requires almost daily headache medication. Prolonged headache that has not been diagnosed earlier. Recurring headaches in a child. Headache that worries the patient. Headaches associated with female hormonal changes. Mayo Clinic pages about tension headache. Medline Plus article about tension headache. 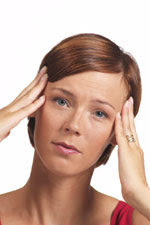 WebMD Slideshow: A Visual Guide to migraine headaches. Medline Plus pages about migraine. WebMD about common medications used to treat or reduce the symptoms of Migraine. Mayo Clinic pages about cluster headaches. Mayo Clinic article about symptoms of sinusitis including headache. Wikipedia about red wine headache. EzineArticles.com about headaches after exercising. Headaches.org about headache and depression. WebMD Migraine Headaches and pregnancy. Merck Manuals about brain turmors. HealthDesk about brain tumors in children. Mayo Clinic information about symptoms of a brain tumor including headache. HealthDesk about aneurysm in the brain. eMedicineHealth about reasons of hematomas. Meningitis Research Foundation info about how to suspect meningitis or septicaemia. FreeMD the anatomy of the head and brain. Great. Information can often reduce unnecessary stress and worries.